While beer drinking seems to be an American past time, especially when sports are on, or the buddies are around or, or, or, there never seems to be an end of reasons, drink beer while running a race? Unbelievably, there are several races that taut beer drinking while running. Who could run a marathon while nipping the bottle? There must be plenty of garbage cans around for those who can't quite hold their alcohol! That would be one messy race. There is a blog online about a woman who ran the San Francisco half marathon while drinking a beer every mile. She blacked out twice and threw up three times but is extremely proud of her "accomplishment". Running and drinking is a strange marriage. Drinking and partying makes more sense. A beer-drinking marathon began in Boston in 2006 as a birthday party for a friend. Paul wanted to do something epic for his birthday. Inspired by the recent Boston Marathon, his friends came up with the idea of the Great Boston Beer Marathon. They even ordered T-shirts so all party goers could be identified. The first year 750 people joined in the craziness, 1350 the next year, 2000 inebriated folks joined the foray and this year marked 3,300 drinkers who come together for 26 different pubs or bars and drink 26 beers in a single day. There is no prize for first place, only a finisher prize if you are still breathing at the end of the day. Viking helmets are the most sought after display of participation, but they are on a first come, first serve basis. Beer drinking has been around for centuries and is especially prolific in the fall. Oktoberfest is a 16-18 day beer festival held annually in Munich, Bavaria, starts the late part of September. Only Munich beer is allowed to be served at this crazy festival. Almost seven million liters of beer are consumed at this event! Don't forget the sauerkraut, sausages and Knodel, Kasspatzn or Reiberdatschi. History tells that the event started in 1811, to honor the marriage of Prince Ludwig and Therese of Saxe-Hildburghausen the year before. Not limited by a single day, the Germans turned this event without any real historical reason into a 17-day drinking binge. 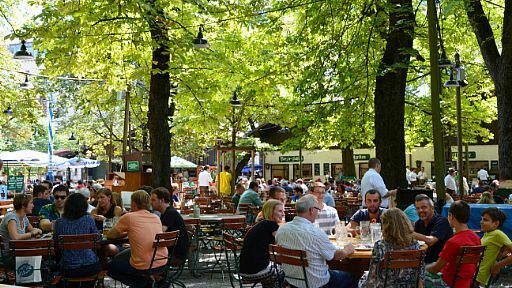 The beer gardens of New Jersey and elsewhere host events every October just to honor the drinking cousins in Germany or as just a great excuse to get together with friends and drink. While running and drinking may not be such a great idea, responsible drinking at the beer gardens in NJ, a favorite pub or bar or just at home with a steak grilling on the barbeque isn't a bad way to end summer and welcome in the winter!